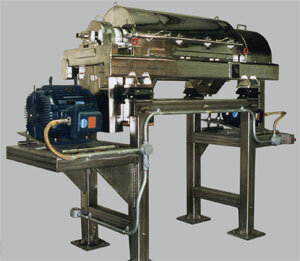 A Super-D-Canter is a solid bowl centrifuge, horizontally mounted, designed for separation of slurries into liquid and solid phases. The solids are discharged continuously through the scrolling section of a screw conveyor which rotates at a differential speed imparted by an integrally mounted planetary gear box. The superiority of Sharples, Pennwalt and Tomoe Super-D-Canter is determined by the following factors. 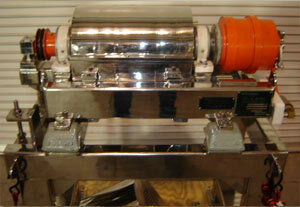 Super-D-Canter operates on the centrifugal sedimentation process. The high sedimentation efficiency and torque capability enables the Super-D-Canter to absorb feed variations more effectively than other types of centrifuge or separation equipment. Super-D-Canter adds to improved production by it's continuous operation. Lesser controls and minimum operation required. Super-D-Canter can replace batch and continuous filters and static sedimentation methods. Major application areas for Super-D-Canter include Clarification of liquids, Classification of liquids, Concentration of solids and Dewatering of lsolids. Savings in Energy, space, manpower and maintenance cost can make A Super-D-Canter an economic and trouble free equipment in your plant. 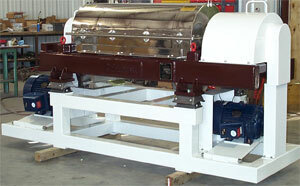 In effluent sludge dewatering, the Super-D-Canter can reduce or totally eliminate expensive preconditioning of feed. 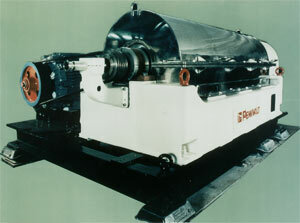 The Super-D-Canter Centrifuges manufactured by Sharples Company, Pennwalt Corp and Tomoe Engineering Company comprises of following major sub assemblies. Casing Design Atmospheric, V. Lip Seal, S. Mech. Seal, C. I. P.